Solomon inherited David’s prophethood and dominion. This was not a material inheritance, as prophets do not bequeath their property. It is given away to the poor and needy, not to their relatives. Prophet Muhammad (pbuh) said: “The prophets’ property will not be inherited, and whatever we leave is to be used for charity.” (Sahih Al-Bukhari). After his father’s death, Solomon became king. He begged Allah for a kingdom such as none after him would have, and Allah granted his wish. 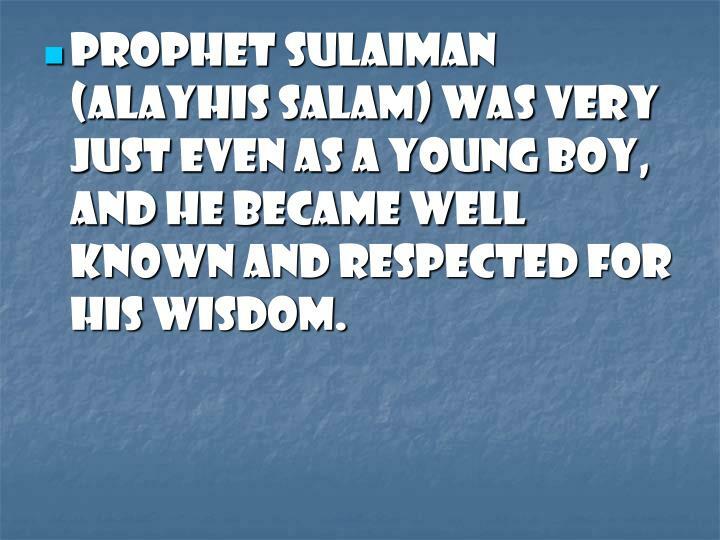 Besides wisdom, Allah had blessed Solomon with many abilities. He could command the winds and understand and talk to birds and animals. Allah directed him to teach both men and jinns to mine the earth and extract its minerals to make tools and weapons. He also favored him with a mine of copper, which was a rare metal in those days. And to David We gave Solomon. How excellent a slave! Verily, he was ever oft returning in repentance (to Us)! When there were displayed before him, in the afternoon, well-trained horses of the highest breed (for jihad in Allah’s cause). And he said: “Alas! I did love the good (these horses) instead of remembering my Lord (in my ‘Asr prayer)” till the time was over, and the sun had hidden in the veil of the night. Then he said: “Bring them (horses) back to me.” Then he began to pass his hand over their legs and their necks (till the end of the display). While they were passing through a valley, an ant saw the approaching army and cried out to warn the other ants: “Run to your homes! Otherwise, unaware, Solomon and his army might crush you!” Solomon, hearing the cry of the ant, smiled. He was glad that the ant knew him to be a prophet who would not intentionally harm Allah’s creation. He thanked Allah for saving the ants’ lives. So he (Solomon) smiled, amused at her speech and said: “My Lord! Inspire and bestow upon me the power and ability that I maybe grateful for Your Favors which You have bestowed on me and on my parents, and that I may do righteous good deeds that will please You, and admit me by Your Mercy among Your righteous slaves.” (Ch 27:17-19 Quran). In Jerusalem, on a huge rock, Solomon built a beautiful temple to draw the people to worship Allah. Today this building is known as “The Dome of the Rock.” From there, a large band of followers joined Solomon on pilgrimage to the Holy Mosque in Mecca. After they had completed their hajj, they traveled to Yemen and arrived in the city of San’a. Solomon was impressed by their clever method of channeling water all over their cities. He was keen to build similar water systems in his own country but did not have enough springs. He set out to find the hoopoe bird, which could detect water under the ground. He sent signals all over the hoopoe to call on him, but it was nowhere to be found. In anger, he declared that unless the bird had a good reason for its absence, he would punish it severely. To check the hoopoe’s information, Solomon sent a letter to the queen with the bird. He instructed the bird to remain hidden and to watch everything. “Verily! It is from Solomon, and verily! It reads: ‘In the Name of Allah, the Most Beneficent, and Most Merciful; be you not exalted against me, but come to me as Muslims (true believers who submit with full submission). '” ( Ch 27:30-31 Quran). The queen was very disturbed and hurriedly summoned her advisors. They reacted as to a challenge, for they felt that there was someone challenging them, hinting at war and defeat, and asking them to submit to his conditions. Solomon’s reconnaissance team brought him the news of the arrival of Bilkis’ messengers with a gift. He immediately realized that the queen had sent her men on a probing mission thus, he gave orders to rally the army. The envoys of Bilqis, entering amidst the well-equipped army, realized that their wealth was nothing in comparison to that of the kingdom of Solomon’s palace floors, which were made of sandalwood and inlaid with gold. They noticed Solomon surveying his army, and they were surprised at the number and variety of soldiers, which included lions, tigers, and birds. The messengers stood in amazement, realizing that they were in front of an irresistible army. He also directed them to take back the gifts to the queen and to tell her that if she did not stop her kind of worship he would uproot her kingdom and drive its people out of the land. The queen’s envoys returned with the gifts and delivered the message. They also told her of the wonderful things they had seen. Instead of taking offense, she decided to visit Solomon. Accompanied by her royal officials and servants, she left Sheba, sending a messenger ahead to inform Solomon that she was on her way to meet him. No sooner had this one – who had the knowledge of the Book – finished his phrase than the throne stood before Solomon. The mission had, indeed, been completed in the blinking of an eye. Solomon’s seat was in Palestine, and the throne of Bilqis had been in Yemen, two thousand miles away. This was a great miracle performed by one of those sitting with Solomon. When Bilqis arrived at Solomon’s palace, she was welcomed with pomp and ceremony. Then, pointing to the altered throne, Solomon asked her whether her throne looked like that one. She looked at it again and again. In her mind she was convinced that her throne could not possibly be the one she was looking at, as hers was in her palace; et, she detected a striking similarity and replied: “It is as if it were the very one, and resembles mine in every respect.” Solomon judged that she was intelligent and diplomatic. He then invited her into the great hall, the floor of which was laid in glass and shimmering. Thinking it was water, as she stepped on the floor, she lifted her skirt slightly above her heels, for fear of wetting it. Solomon pointed out to her that it was made of solid glass. She was amazed. She had never seen such things before. Bilqis realized that she was in the company of a very knowledgeable person who was not only a ruler of a great kingdom but a messenger of Allah, as well. She repented, gave up sun worship, accepted the faith of Allah, and asked her people to do the same. It was finished; Bilqis saw her people’s creed fall apart before Solomon. She realized that the sun which her people worshipped was nothing but one of Allah’s creatures. Al-La (this word has two interpretations) [As Satan has barred them from Allah’s Way} so that they do not worship (prostrate before) Allah, or so that they may worship (prostrate before) Allah, Who brings light to what is hidden in the heavens and the earth, and knows what you conceal and what you reveal. Allah, La ilaha illa Huwa (none has the right to be worshipped but He), the Lord of the Supreme Throne! And that which she used to worship besides Allah has prevented her from Islam, for she was of a disbelieving people. It was said to her: “Enter As-Sarh” (a glass surface with water underneath it) or a palace, but when she saw it, she thought it was a pool, and she tucked up her clothes, uncovering her legs. Solomon’s public work was largely carried out by the jinns. This was a punishment for their sins of making people believe that they were all-powerful, knew the unseen, and could foresee the future. As a prophet, it was Solomon’s duty to remove such false beliefs from his followers. Solomon lived amidst glory, and all creatures were subjected to him. Then Allah the Exalted ordained for him to die. His life and death were full of wonders and miracles; thus, his death harmonized with his life and glory. His death, like his life, was unique. The people had to learn that the future is known neither by the jinns, nor by the prophets, but by Allah alone. Solomon’s effort in this direction did not end with his life, for even his death became an example. He was sitting holding his staff, overseeing the jinns at work in a mine. He died sitting in this position. For a long time no one was aware of his death, for he was seen sitting erect. The jinns continued with their sand toil, thinking that Solomon was watching over them. Many days later, a hungry ant began nibbling Solomon’s staff. It continued to do so, eating the lower part of the staff, until it fell out of Solomon’s hand, and his great body fell to the ground. People hurried to him, realizing that he had died a long time ago and that the jinns did not perceive the unseen, for had the jinns known the unseen, they would not have kept working, thinking that Solomon was alive. And We caused a fount of molten brass to flow for him, and there were jinns that worked in front of him by the Leave of his Lord, and whosoever of them turned aside from Our Command, We shall cause him to taste of the torment of the blazing Fire. They worked for him what he desired, (making) high rooms, images, basins as large as reservoirs, and (making) cauldrons fixed (in their places). “Work you, O family of David, with thanks!” But few of My slaves are grateful. Then when we decreed death for him (Solomon), nothing informed them (jinns) of his death except a little worm of the earth, which kept slowly gnawing away at his stick, so when he fell down, the jinns saw clearly that if they had known the unseen, they would not have stayed in the humiliating torment. (Ch 34:12-14 Quran). I asked Ibn ‘Abbas (radiallaahu `anhu), “Should we perform a prostration on reciting Surat-Sad?” He recited (the Sura) including: ‘And among his progeny, David, Solomon..(up to)…so follow their guidance (6.84-91) And then he said, “Your Prophet is amongst those people who have been ordered to follow them (i.e. the preceding apostles). Then, to everyone’s surprise, a youth stepped forward. A roar of laughter echoed from the enemy’s side, and even Saul’s men shook their heads. The young man was David (Dawud), from the city of Bethlehem. His elderly father had chosen three of his sons to join Saul’s army. He had instructed the youngest one, David, not to take part in the fighting but to help the army in other ways and to report to his father daily on what was happening on the war front. David became a hero overnight. Saul kept his word and married his daughter Michal (Miqel) to the young warrior and took him under his wing as one of his chief advisors. So they routed them by Allah’s Leave and David killed Goliath, and Allah gave him (David) the kingdom (after the death of Saul and Samuel) and wisdom, and taught him of that which He willed. And if Allah did not check one set of people by means of another, the earth would indeed be full of mischief. But Allah is full of Bounty to the Alamin (mankind, jinns and all that exist). (Ch 2:251 Quran). David became the most famous man among the Israelites. However, he was not inveigled by this; he was not a prisoner of fame or leadership but a prisoner of Allah’s love. Creatures such as the plants, birds, beasts, and even the mountains responded to his voice glorifying Allah. Allah had chosen David to be a prophet and revealed the Psalms to him. As He the Almighty said: And to David We gave the Psalms. (Ch 17:55 Quran). David recited his scripture and glorified Allah while the mountains joined him praise and the birds rallied around him. Almighty Allah directed: Be patient (O Muhammad) of what they say, and remember Our slave David, endured with power. Verily, he was ever oft-returning in all matters and in repentance toward Allah. (Ch 38:17 Quran). David’s sincerity was not the only factor responsible for the birds and beasts joining with him in glorifying Allah, nor was the sweetness of his voice. IT was a miracle from Allah. This was not his only miracle, for Allah also endowed him with the faculty of understanding the languages of birds and animals. David (pbuh) fasted every other day. Abdullah Ibn Amr Ibn Al-As narrated: Allah’s Apostle (pbuh) said to me: “The most beloved fasting to Allah was the fasting of the Prophet David, who used to fast alternate days. And the most beloved prayer to Allah was the prayer of David, who used to sleep the first half of the night, and pray for one third of it and again sleep for a sixth of it. '” (Sahih Al-Bukhari). The people praised and loved David. However, the hearts of men are fickle and their memories short. Even great men can feel insecure and become petty-minded. One day David found Saul in a worried state. He sensed something strange in Saul’s attitude towards him. That night, when he shared his feeling with his wife, she started to weep bitterly and said: “O David, I will never keep any secrets from you.” She told him that her father had become jealous of his popularity and feared that he would lose his kingdom to him. She advised him to be on his guard. This information shocked David very much. He prayed and hoped that Saul’s good nature would overcome the darker side of his character. The following day, Saul summoned David to inform him that Canaan had gathered its forces and would march on the kingdom. He ordered David to advance on them with the army and not to return unless victory was gained. David sensed that this was an excuse to get rid of him; either the enemy would kill him, or in the thick of battle, Saul’s henchmen might stab him in the back. Yet he hastened with his troops to meet the army of Canaan. They fought the Canaanites brav, without thinking of their own safety. Allah granted them victory, and David lived to return to Saul. Unfortunately, this only increased Saul’s fear, so he plotted to kill David. Such is jealousy that not even a daughter’s well-being mattered. Michal learned of her father’s plan and hurried to warn her husband. David gathered some food and things, mounted his camel and fled. He found a cave in which he remained hidden for many days. After a time, David’s brothers and some citizens joined forces with him. Saul’s position became very weak, for he began to rule with a heavy hand. He ill-treated the learned, tortured the reciters of the Talmud, and terrorized his soldiers. This worsened his position, and his subjects began to turn against him. He decided to go war against David. Hearing this news, David marched to confront Saul’s army. The king’s army had traveled a great distance and was overcome by fatigue, so they decided to rest in a valley, where they fell asleep. Quietly, David crept up to the sleeping Saul, removed his spear, and cut off a piece of his garment with the sword. David then awakened the king and told him: “Oh king, you come out seeking me, but I do not hate you, and I do not want to kill you. If I did, I would have killed you when you were asleep. Here is a piece of your garment. I could have hacked your neck instead, but I did not. My mission is that of love, not malice.” The king realized his mistake and begged for forgiveness. Time passed and Saul was killed in a battle in which David did not take part. David succeeded Saul, for the people remembered what he had done for them and elected him king. So it was that David the Prophet was also a king. Allah strengthened the dominion of David and made him victorious. His kingdom was strong and great; his enemies feared him without engaging in war with him. Prophet David was a just and righteous ruler who brought peace and prosperity to his people, and whom Allah honored as a messenger. He delivered Allah’s message to the people through the precious gift of his melodious voice. When he recited the Psalms (Zaboor), it was as if the rest of creation chanted with him; people listened as if in a trance. The messages David delivered are famous and well remembered. They are known in the Bible as the Psalms or Songs of David. David divided his working day into four parts: one to earn a living and to rest, one to pray to his Lord, one to listen to the complaints of his people, and the last part to deliver his sermons. He also appointed deputies to listen to his subjects’ complaints so that in his absence people’s problems might not be neglected. The two men vanished like a cloud, and David realized that they were two angels sent to him to teach him a lesson. He should not have passed a judgment without hearing from the opposing party. And David guessed that We have tried him and he sought Forgiveness of his Lord, and he fell down prostrate and turned to Allah in repentance. So We forgave him that, and verily, for him is a near access to Us, and as good place of final return Paradise. O David! Verily! We have placed you as a successor on earth, so judge you between men in truth and justice. And follow not your desire for it will mislead you from the Path of Allah. Verily! Those who wander astray from the Path of Allah shall have a severe torment, because they forgot the Day of Reckoning. (Ch 38:21-26 Quran). David worshipped Allah, glorified Him and sang His praise until he died. According to traditions, David died suddenly and was mourned by four thousand priests as well as thousands of people. It was so hot that people suffered from the intensity of the sun. Solomon called the birds to protect David and the people from the sun, and they did so until he was buried. This was the first sign of his dominion to be witnessed by the people. The people of Madyan were Arabs who lived in the country of Ma’an, part of which today is greater Syria. They were a greedy people who did not believe that Allah existed and who led wicked lives. They gave short measure, praised their goods beyond their worth, and hid their defects. They lied to their customers, thereby cheating them. Allah sent His Prophet Shu’aib (pbuh) armed with many miracles. Shu’aib preached to them, begging them to be mindful of Allah’s favors and warning them of the consequences of their evil ways, but they only mocked him. Shu’aib remained calm as he reminded them of his kinship to them and that what he was doing was not for his personal gain. They seized the belongings of Shu’aib and his followers, then drove them out of the city. The Messenger turned to his Lord for help, and his plea was answered. Allah sent down on them scorching heat and they suffered terribly. On seeing a cloud gathering in the sky, they thought it would bring cool, refreshing rain, and rushed outside in the hope of enjoying the rainfall. Instead the cloud burst, hurling thunderbolts and fire. They heard a thunderous sound from above which caused the earth under their feet to tremble. The evil doers perished in this state of horror. But, they belied him, so the torment of the day of shadow (a gloomy cloud) seized them, indeed that was the torment of a Great Day. Verily, in this is a sign yet most of them are not believers. And verily! Your Lord, He is indeed the All Mighty, the Most Merciful.” (Ch 26:176-191 Quran). The Prophet (sallallaahu `alayhi wasallam) said, “One should not say that I am better than Jonah (i.e. Yunus) bin Matta.” So, he mentioned his father Matta. The Prophet (sallallaahu `alayhi wasallam) mentioned the night of his Ascension and said, “The prophet Moses was brown, a tall person as if from the people of the tribe of Shanu’a. Jesus was a curly-haired man of moderate height.” He also mentioned Malik, the gate-keeper of the (Hell) Fire, and Ad-Dajjal. When the Prophet (sallallaahu `alayhi wasallam) came to Medina, he found (the Jews) fasting on the day of ‘Ashura’ (i.e. 10th of Muharram). They used to say: “This is a great day on which Allah saved Moses and drowned the folk of Pharaoh. Moses observed the fast on this day, as a sign of gratitude to Allah.” The Prophet said, “I am closer to Moses than they.” So, he observed the fast (on that day) and ordered the Muslims to fast on it. Read the full narration here. Ibn Ishaaq stated that he was a man of Rum. His names was Job Ibn Mose Ibn Razeh Ibn Esau Ibn Isaac Ibn Abraham. Someone else said he was Job Ibn Mose, Ibn Rimil Ibn Esau Ibn Isaac Ibn Jacob. There have also been other statements in his lineage. Ibn Asaker narrated that his mother was a daughter of Prophet Lot.It was said, also, that his father was one who believed in Abraham when he was cast into the fire. Job was repentant, remembering Allah with thankfulness, patience and steadfastness. This was the cause of his rescue and the secret of Allah’s praising him. Iblis, overhearing all this, became annoyed. He planned to tempt Job to corruption and disbelief, so he hastened to him. He tried to distract Job from his prayers by whispering to him about the good things in life, but Job was a true believer and would not let evil thoughts tempt him. This disturbed Iblis more; thus he began to hate Job even more. Allah told Iblis that Job was one of His most sincere devotees. He did not worship Him because of the favors; his worship stemmed from his heart and had nothing to do with material things. But to prove Iblis the depth of Job’ s sincerity and patience, Allah allowed him to do whatever he and his helpers wished with Job’s wealth. With these words, Job again prostrated to his Lord. Allah granted Iblis authority, but warned him that it would not reduce Job’s faith in his Lord nor his patience. Armed with this new authority, Iblis began to take revenge on Job’s body and filled it with disease until it was reduced to mere skin and bone and he suffered severe pain. But through all the suffering Job remained string in his faith, patiently bearing all the hardships without complaining. Allah’s righteous servant did not despair or turn to others for help but remained hopeful of Allah’s Mercy. Even close relatives and friends deserted him. Only his kind loving wife stayed with him. In his hour of need, she showered her kindness on him and cared for him. She remained his sole companion and comforter through many years of his suffering. Iblis went to Job’s wife in the form of a man. “Where is your husband?” he asked her. Job obeyed, and almost immediately his good health was restored. Meanwhile, his faithful wife could no longer bear to be parted from her husband and returned to beg his forgiveness, desiring to serve him. On entering he house, she was amazed at the sudden change: Job was again healthy! She embraced him and thanked Allah for His mercy. Abu Huraira (ra) narrated that the Prophet Muhammed (pbuh) said: “While Job was naked, taking a bath, a swarm of locusts fell on him, and he started collecting them in his garment. His Lord called him: ‘O Job! 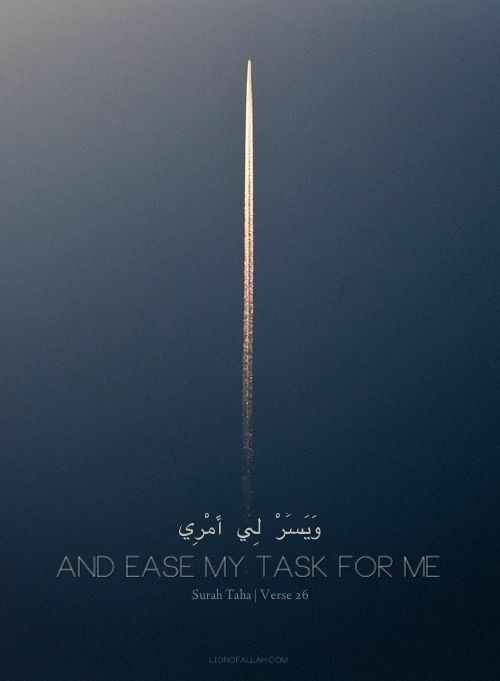 Have I not made you too rich to need what you see?’ He said: ‘Yes, O Lord! But I cannot shun Your Blessings” (Bukhari).